I am convinced the next composition of the European Parliament will drastically differ from the one we have now, says chairman of Latvian Association of Regions Edvards Smiltēns. The influence of European People’s Party, in which LAR deputies could be members, may reduce. The same could be said about the influence of Progressive Alliance of Socialists and Democrats. According to him, the influence of Alliance of Liberals and Democrats for Europe may increase. Until now Latvian politicians have had the closest ties with German politicians. The balance of power is undergoing geographical changes. Previously Europe was dominated by the opinion of German Chancellor Angela Merkel. Now it seems French President Emmanuel Macron has taken the lead in spite of protests from ‘yellow vests’, Smiltēns says. «My cooperation with France is years long. I was even awarded with the Order of the Legion of Honour. I think Macron has a plan he wants to implement after European Parliament elections. We may be presented with a new vision that could potentially affect the division of powers in the European Parliament,» says Smiltēns. LAR will decide on joining a specific EP political party after elections. Currently many MEP candidates say they want to work in the European People Party group. Because of that, LAR doubts it should do the same thing. Perhaps it would be more pragmatic and better for Latvia if more of its representatives were present in some other political group, which would provide bigger political influence. In previous compositions of the European Parliament, Latvian MEPS suggested rather grounded goals. In the last elections emphasis was put on security, because there was an enormous and aggressive wave of migrants wishing to enter Europe. Latvian MEPs wanted fairer direct payments to farmers and improved cohesion. Currently, according to Smiltēns, it is important to stress in the EP that all EU citizens have equal rights and opportunities. EU does not have old and young member states. There is a unified European Union. We are working to provide consumers in all of EU with goods and services of equal quality and further reduce the difference of quality among member states – such as medicines and food products. «We intend to carefully follow the decisions made in the European Parliament,» promises LAR leader. Currently the European Parliament talks a lot about climate change and reduction of CO2 emissions. We are responsible for the next generations. Because of that, we have a duty to resolve climate change problems. But there is no way to blindly follow offers that come from the European Commission. Latvia’s production output capacity is far below other EU member states. «While fighting against CO2 emissions we have cut the roots for our industrial production growth,» says Smiltēns. LAR will try securing support from the European Parliament for an alternative solution – restoration of state forests. Currently funding for this measure reaches only EIR 30 million. The actual demand for funds is three times higher. A single hectare of forest consumes 500 tonnes of CO2. This way we could increase stores of timber, which is our main export product, create new jobs and contribute to creation of new wooden buildings. 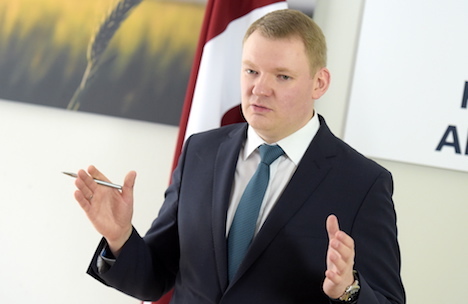 «I am convinced we will represent Latvia’s national interests in the European Parliament. The only question is how actively Latvian residents will participate in elections and will they provide our members an opportunity to fight for Latvia’s interest in Brussels and Strasbourg. I can promise that every hour LAR deputies will spend in the EP will be used to lobby Latvia’s interests,» says LAR leader.